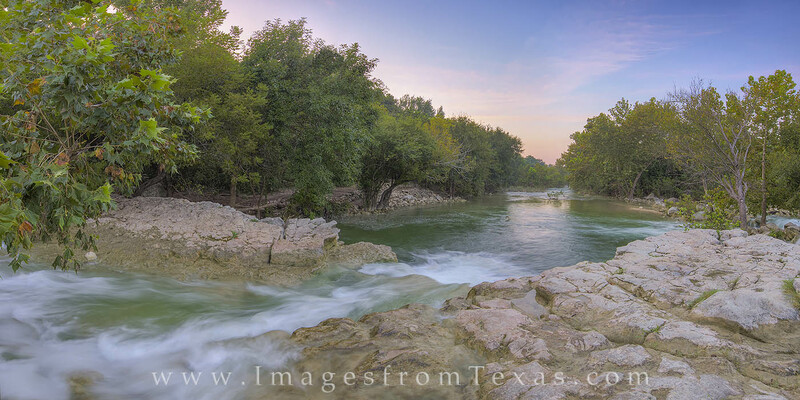 On a perfect morning in Austin, Texas, this is the Barton Creek Greebelt at Twin Falls. This beautiful location is only a half mile from MoPac, but you can feel like you are along in the woods. The key is getting up early and enjoy the peace and quiet before the masses take advantage of this hike along the creek. While I’m often the first person in the parking area near the trailhead, there are usually 25-50 cars parked by the time I leave. This panorama was taken while standing in the cool water as it flowed around my legs and my camera tripod.